With Steve Bannon out of the White House, the role of the most repulsive, alt-right, Nazi deplorable in the Trump Administration falls to ‘senior’ advisor and Pauly Shore look-a-like, Stephen Miller. We say ‘senior’ facetiously because this twerp is only thirty-two years old and knows absolutely squat. He was in high school when Dubya sent troops to Afghanistan for Pete’s sake and he was supposedly transformed by reading NRA head, Wayne LaPierre. This is one broken human being and yet he’s got the ear of American CEO/Dictator Donald Trump. We think of him as a cross between Wormtongue and Himmler. There’s been much speculation that he’s behind most of Trump’s immigration bans and that his advice nixed any deals on DACA last month. From all accounts, he’s always been a hateful person who delights at creating havoc, chaos and misery for anyone who doesn’t agree with his narrow minded world view; unfortunately a perfect fit for the modern day, authoritarian, fascist Republican party. We’re hoping, for the good of the nation, that the Stephen Miller: Racist Dickhead show will get cancelled before it gets to a third season. 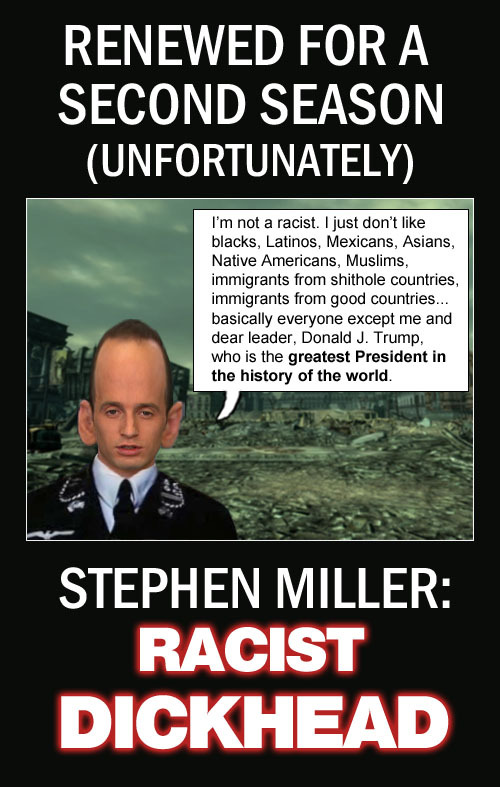 Stephen Miller, ‘senior’ advisor to American CEO/Dictator Donald Trump and racist dickhead extraordinaire, explains the subtle intricacies of his complex world view.